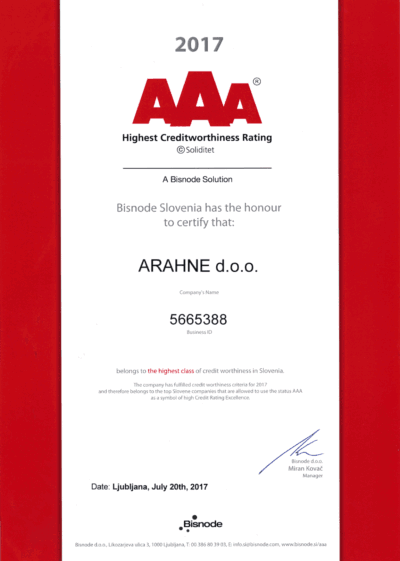 We are proud to announce that Arahne was once again awarded with the AAA Highest Creditworthiness Certificate rating by Bisnode, a Swedish credit rating company. This is the sixth consecutive year. Credithworthiness Certificate is an evidence of credibility and reliability of our company, proving we are a company of high ethical standards, strong ability to meet current payment obligations and quality products and services. Arahne is a stable and profitable company with 25 years of experience. Our results guarantee, that we will be a reliable partner also in the future.